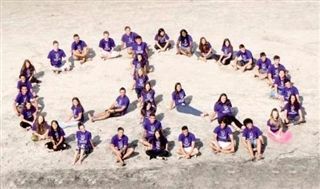 This July, a group of Pacific Ridge students joined teenagers from Israel, Palestine, and the United States for a cross-cultural dialogue and peace-building program. The program, put on by interfaith coexistence non-profit Hands of Peace and coordinated by history teacher and Hands of Peace site director Scott Silk, has been hosted at Pacific Ridge for the past two years. The 17-day program empowers young people to find their voice as peace leaders, break down stereotypes and gain the knowledge and critical thinking skills needed to take steps toward peace in their home communities. Participants engage in intensive daily dialogue sessions, led by professional facilitators, in which they share personal stories, listen, and share views about paths for peace. This year's activities also included a music workshop, mural painting, and a visit to the Mexican border.